Junior Brooke Bryan scored 11 goals, including the game-winner in the closing seconds, as visiting Oaks Christian beat Newbury Park 12-11 to claim the first Marmonte League win in the brief history of the Lions’ program. 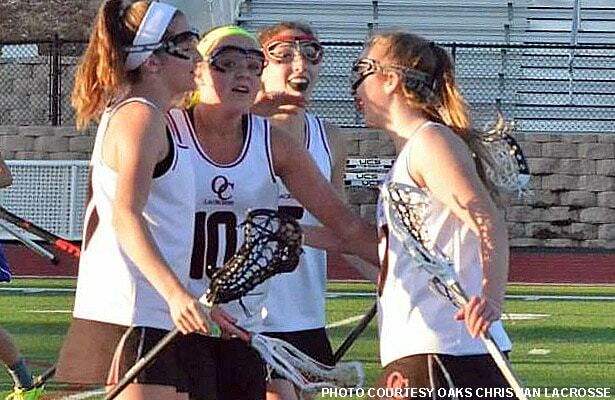 Oaks Christian (3-1) went 0-7 in its inaugural season of girls lacrosse last spring, losing to Newbury, Agoura and Westlake twice each. But with a year of experience — and Bryan leading the offense — 2016 is shaping up to be quite different. “[I’m] very pleased with the tremendous growth this young team has demonstrated in Year Two of the program,” coach Devin Markle said. Bryan controlled 20 draws in Wednesday’s contest in addition to her prolific goal-scoring. Junior defender Sarah Spaeth anchored the defense and contributed a goal, and senior goalie Taylor Erlich made 10 saves to keep the Lions in the game. Oaks Christian led 7-2 at one point, but Newbury Park rallied and actually led 11-10. But the Lions scored twice in the final minute to pull out the victory. Pictured, from left: Sarah Spaeth, Brooke Bryan, Grace Conti and Tatum Shore. Information provided by Oaks Christian Lacrosse.